The Great Tyne Row has now run four times, with the most recent on 20 September 2014. It is a 25 km challenge row with an element of racing (i.e. some prizes for fastest in various categories), but with an emphasis on fun. Numbers have risen from 11 in year one to 34 competing this year. And we now have a whole range of sliding seat and fixed seat boats entering. You can find information on previous years here: 2012 and 2013. The event is organised by the Northern Rowing Council in association with British Rowing, Tyne Rowing Club, Gosforth Community Rowing, Tyne United Rowing Club and Tynemouth Rowing Club. We acknowledge invaluable support from Port of Tyne, Northumbria Police and many others. Those doing the work are almost all volunteers (but acting as professionally as we can). First, well done to everybody who completed the course as a rower or cox and thanks to all volunteer helpers up and down the river. The results are here (pdf). Please see the note below about mass delays during the race and how results were decided. Improvements in how we cope with such a situation next year are already being discussed! Crews entered from as far afield as Borth in west Wales, Anstruther in Scotland and Weybridge near London. It was great to see an even wider range of boats than in 2013 on the river, including St Ayles Skiffs, sliding seat coxed quads, fours and doubles, a Celtic Longboat, a Hanningfield Skiff (look it up) and a Dragon Boat. This year with a larger event the committee were able to afford shields to present to the overall fastest boats, newly named after local rowing or maritime related heroes. The Grace Darling Shield (for fastest women’s fixed seat boat) sponsored by Jordan Boats is named after the Northumberland lighthouse keeper’s daughter famed for participating in the rescue of survivors from the shipwrecked SS Forfarshire in 1838. This year it was won by St Ayles Rowing Club from Fife. The Henry Frederick Swan Shield (for fastest fixed seat boat) sponsored by Jordan Boats is named after a former lifeboat built in 1917 which saved lives on the Tyne and North Sea until 1947 and is currently being restored by the NE Maritime Trust. In turn this was named after Henry Swan himself, a farmer’s son who went on to co-found in 1880 what became Swan Hunter shipbuilders at Wallsend. This year it was won by North Berwick Rowing Club. The Catherine Cookson Foundation Shield (for fastest women’s boat) was kindly donated by Newcastle University. Renowned Tyneside novelist Dame Catherine Cookson set up a fund to support academic initiatives within the University and the related Foundation is currently funding a student to look into the history of Tynemouth RC (celebrating their 150th in 2017). 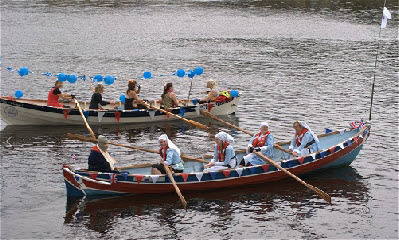 This year it was won by Hexham Rowing Club. The William Fawcus Shield (for fastest boat) was kindly donated by Allen Lambert, President of Tynemouth RC, and named after Tynemouth RC rower of that name, who was the first provincial sculler to win the Diamond Singles at Henley Royal Regatta. He also won the Wingfield Sculls in the same year, 1871. This year it was won by Devil’s Elbow Rowing Club. The Newcastle City Marina Best Decorated Boat prize went to St Ayles RC for the lovely froggy decorations on the boat whilst the Best Dressed Crew went to Gosforth Community RC for a their fantastic dress as gondoliers. The Harry Clasper Award (given at the discretion of the organisers to a deserving rower or crew) went to Angela Reid of Byker Community RC. This was given to Angela to show that anyone can take part in rowing, even if you’ve recently completed a course of chemotherapy and will be having another operation in a month’s time. The Byker crew also won the “Enjoying the View” award for proving it’s the taking part not the winning that counts. As crews arrived onto the beach at Tynemouth Hannabiell and the Midnight Blue welcomed them with a taste of Afro-Caribbean and Latin percussion and brass, to liven up the atmosphere as crews disembarked and tucked into the barbeque. The organising committee already have sights set on next year with the date of September 6th pencilled in. More information (and a new web site) will be following soon, so keep your eyes peeled. Note: Due partly to an expected DFDS ferry but more to two other large ship movements all about the same time, crews had to be halted and times were not taken; awards and prizes were thus awarded to crews who crossed the line first in their category - see results here. This will be a key issue in our wash-up meeting or meetings and we will plan for such eventualities better next year. The draw showing which category/division boats were entered, start times and boating locations is downloadable below. In the morning the event start was run from Tyne Rowing Club, but some clubs were asked to boat from Tyne United Rowing Club across the river and others (generally the fixed seat boats) from the slipway at Tyne Riverside Country Park at Newburn. The start was a very short distance downstream from the boating points. The finish of the race was a short distance upstream of Tynemouth Rowing Club, where boats landed. Detailed instructions on boating, navigation and landing from, 2014 can also be downloaded below. The background documents were primarily for the organising team, but you are welcome to read them. After party at finish host club Tynemouth RC following prize-giving. Telephone: Colin Percy, GTR Coordinator for 2014, on 07985 003304. This page last updated on 07-10-14.